The four founding Union of Jewish Universalist Communities' Rabbis will deliver a path to spiritual renewal with innovative services for Rosh Hashanah on October 3 and Yom Kippur on October 12. 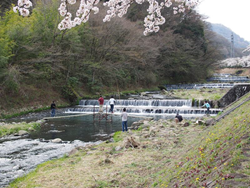 A UJUC community will observe Tashlich at the Hayakawa River in Japan. UJUC services will range from a Jazz High Holiday in New York City to an outdoor service in a hillside town near Mt. Fuji in Japan. The High Holidays, in Hebrew Yamim Noraim, the Days of Awe, begin the Jewish New Year and last for 10 days ending with the Day of Atonement. They are a time of reflection and rejuvenation. The UJUC offerings create a vanguard space to honor tradition with creativity and ingenuity, pillars of Judaism. Services range from a Jazz High Holiday service offered by Sim Shalom and its Founder Rabbi Steven Blane at the iconic Bitter End in New York City to an outdoor service in the hillside town of Hakune near Mt. Fuji in Japan led by Rabbi Ivan Browner. There will be heavenly sounds from Temple B'nai Israel in Florence, Alabama, led by Rabbi Nancy Tunick. "Congregants will lead a reading or prayer, and each solo voice will lead to the next, becoming one glorious song." In California, a synagogue without walls, led by Rabbi Eran Bar-Adon, will reflect by the Pacific Ocean with music, song and meditation. Jewish Universalism is a new movement in Judaism established in 2014 to nurture participation in Jewish practice without barriers. It espouses love for all mankind and acceptance. The services celebrate plurality with song and worship. According to Rabbi Blane, "The UJUC's mission is to strengthen the rich and diverse tapestry of Judaism with joy, wisdom, and inclusiveness. The diverse offerings of its Founding Rabbis illustrate the breadth of these communities." The New York City Jazz services will meld traditional liturgy with the improvisation of jazz. Rabbi Blane and his jazz quartet will offer up Sim Shalom's services to a live local congregation and streamed around the globe. In Japan, individuals searching to perform Tashlich, the Jewish ritual of symbolically casting away one's sins, can join Rabbi Browner at the Hayakawa River. Rabbi Browner serves locals curious about Judaism as well as the many Jewish visitors to Tokyo. Congregants in the South can join Rabbi Tunick in Alabama and her services filled with music in a mix of traditional and original melodies. Her services are free and all are welcome. The intimate service in California will be shared by families singing and eating foods like pomegranates and apples dipped in honey, symbolizing the sweetness of the New Year and paradise. For more information about the UJUC and its Founders, click here. You can read more about the other UJUC Rabbis at the site. Sim Shalom is an interactive online Jewish Universalist synagogue which is liberal in thought and traditional in liturgy. Created in 2009 by Rabbi Steven Blane on Manhattan's Upper West Side, Sim Shalom offers a means of connecting the unconnected. Rabbi Blane leads accessible and short Kabbalt Shabbat services every Friday night using a virtual interface and, additionally, Sim Shalom provides online education programs, Jazz concerts, conversion and life-cycle ceremonies along with weeknight services at 7:00PM EST, led by Rabbis and students of this online community. Rabbi Blane is also the founder and director of the Jewish Spiritual Leader's Institute, http://www.jsli.net, the online professional rabbinical program.